B-Ike can support small group tour with maximum four guests who are independently to plan and visit their destinations. The package tour with large coach is easy, however, you would wish to feel managing your itinerary freely with more flexibility. A tour with rent-a-car could be an ideal solution for a small group, however, to drive a rent-a-car on Japanese roads without local guide, especially in rural area, could be difficult due to traffic signs in Japanese unfamiliar. B-Ike would offer you tour guiding service by licensed English tour guide and unique transportation service named "Pay-GTP" service" as blow, that is totally different from paid transportation service. While B-Ike provide you with paid English guiding service and free driving service by using B-Ike's wagon to various locations inside and outside of Tokyo, B-Ike would like our guests to pay for transportation expenditures for gas (G), toll of highway(T), and parking(P), directly to each of service facilities. It means that B-Ike does not take any profit from these transportation expenditures. If you are in small group tour with 2 to 4 people, this Pay-GPT service will make your tour much more inexpensive, flexible, and convenient, compared with other normal packed tours by using coach and public transportation. In order to make your Japan local tour more flexible and more attractive, how about taking E-bike rental service and enjoy E-bike tour by stopping by various scenic spots to touch Japanese natures, cultures, and histories. Even in hilly area, our E-bikes equipped with powerful motors and batteries can assist your comfortable bike tour. 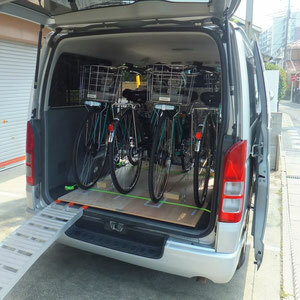 B-Ike's wagon can carry maximum four guests and four E-bikes to any destinations where you would like to make your own E-bike tour. 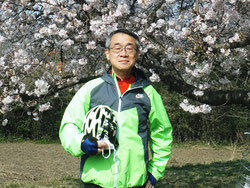 Our tour guide can also lead your E-bike tour without paying additional guide fee. Note 1: Meals and drinks is separately paid by guest. Note 2: Car insurance of B-Ike covers accidents of guests during car transportation. Note 3: For safety reason, B-Ike's E-bike is usable only by a guest higher than 147 cm or 58 inches. We are sorry that there is no E-bike available for a guest who's height is less than 147 cm or 58 inches. Note 4: The E-bike rental fee includes accident insurance to cover injury of guests, however, not to cover liability for damages to the third parties, caused by guests during the bike tour.